Another month of 2014 has flown by. This month has fewer links. My only excuse is that I’ve been spending more time on the bike preparing for the Tour Divide. That’s not a bad thing, but it does cut into time for other activities. This month’s links cover the idea of creating systems rather than goals, the hopes of parents, and habits. All great topics to help us on our journeys. May My Sons Grow Up To Be Dirtbags – Expect Adventure – How could you not want your kids to be happy, be good company, and love their mom like a good dirtbag does? When Breath Meets Busy – Be More With Less – A simple breathing pattern for when the busy-ness starts to be too much. Oh the views to be had when running after a fresh coat of snow. 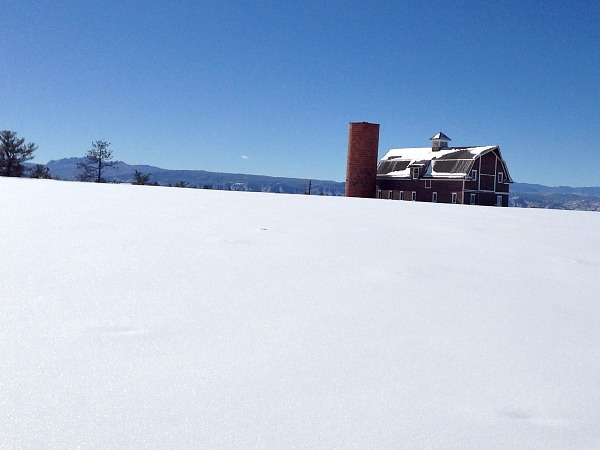 The blanket of untouched snow leading up to the barn makes it a very peaceful picture. After going back and re-reading these articles, it’s quite apparent I’ve been thinking about habits and systems a lot this month. I’m not sure if this is related to me focusing more on the Tour Divide as the date gets closer, or if it’s my mind wandering and settling on these topics while on long bike rides. Either way, focusing on small daily steps towards the desired outcome (for me, that is training and trying to write each day) has allowed me to turn them into habits that are part of my daily routine.